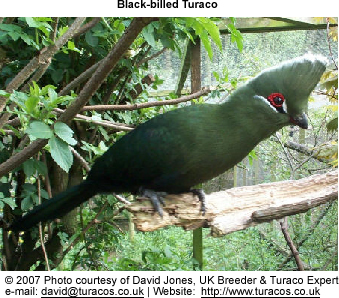 The Black-billed Turaco, Tauraco schuetti, is a medium-sized turaco, that can be found in the forests of Central Africa, Democratic Republic of Congo, Uganda, West Kenya, Burundi, Rwanda and southern Sudan. It is a widespread species, and is not threatened globally. This turaco averages 40cm in length; ranging in weight from 199-272 g.
Adults are similar to Green Turaco, distinguished by a small, all black bill and rounded whitish crest. Its call is a resonant "kwah khaw kwah". The hen lays two eggs in a platform of twigs around 3 or 5 meters above the ground. Both the male and female defend a territory and share with incubation duties.